The above requirements are NOT very different to OTHER countries such USA, Australia where a similar requirement is in place. Getting a degree from one of the TOP UK Universities will help increase your chances of meeting the above critera to be eligible for a Tier 2 Skilled Worker Visa. Contact us http://www.combineco.com/ for guidance !! Top UK University spotlight: Liverpool JM University. Scholarships available for Sept 2012 intake. see the video presentation ! AMBA accredited. Contact us for admissions and scholarships ! Studying U.K can be a rich and fulfilling experience for any student, especially those who have their eyes on a rich educational future. While many high school students out there are able to participate in student exchange programs before college the most viable and useful study abroad programs are often made available to students in college. Students are given the opportunity to study in their field at a campus. Universities in the UK offer world-class international education of the highest standards. It has one of the oldest systems of education with a global reputation. UK provides a very vibrant, cosmopolitan environment for international students with a wide variety of study options from among the 1000's of Educational Institutions. Student must have a proof of funds to pay tuition fees and other expenses like living expenses and transportation etc. The international student must be free from any criminal record, in good health and have to submit a medical certificate. On their arrival in U.K, students are required to show documents like valid passport, letter from visa office, acceptance letter copy from respective college, proof of funds for tuition fee and reference letter. All these items should be handy since you may not be approved to enter in U.K in the absence of any of these documents. You might be entitled for free or subsidized medical treatment under the NHS(National Health service), but in order to avail this benefit the duration of your course must be at least six months. If you are not eligible for NHS then you must take out an international student health insurance. The UK provides great educational opportunities for students and having such an experience on a resume is impressive to a prospective employers. Employers like to see when an individual is willing to do what it takes to better themselves. This shows that employer that the prospect is willing to go above and beyond in order to succeed. The cost of living varies as per foreign student’s needs and standard of living. Accommodation is available in private apartments, hostels and home stays apart from on campus residence. If you have decided to make U.K your study destination, then ask a reliable and trustful Education Consultants U.K to guide you towards easy Student immigration to U.K.
One of the great things about Studying U.K is that the school can take care of a lot of the complications that a traveling student might otherwise have to deal with on their own. There are some things that a student traveling U.K could do to make their trip as enjoyable and stress-free as possible. Some useful guidelines to remember ! Try and indicate how the Scholarship funding is appropriate for you given availability of your/family funds. Would you be able to undertake the proposed course of study without this funding ? Overall as compared to your peers. Discuss with your referee your areas of strength and areas for improvement. Give him/her insight regarding assessment in terms of your academic and intellectual ability and achievements to date. Overall as compared to his/her peers. Dont wait till 30 April 2012 to apply for the FULL UK Masters scholarhips for Sept 2012 entry ! Scholarship interview tips. Several scholarships interviews are being conducted in India for Sept 2012 intake (e.g. 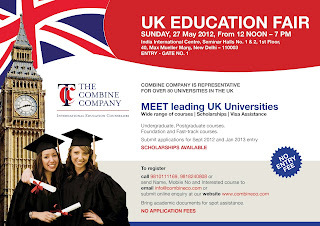 Felix Univ of London Full Masters/Phd scholarships, UK Masters FULL Scholarships in May & June 2012). 1. Know the exact place and time of the interview, the names of the interviewers, eg. full name andcorrect pronunciation and their titles. 2. Learn pertinent facts about the scholarship. 3. Find out why the interviewer is interested in your qualifications and academic record. 4. Determine how the opportunity will impact your immediate and long-term career development. 5. An interview is a "two-way street." Know what questions to ask during the interview. Your questions allow the representative to evaluate your professional and personal needs. Insightfulquestions help both of you determine if your relationship will be mutually rewarding. Lastly, thebetter you understand the opportunity, the more you will be able to communicate your interest inthe scholarship. 6. Put your best foot forward. Always wear proper attire and greet your interviewer with a firmhandshake and an enthusiastic smile. 7. Practice with fellow students/ your supervisor to improve your confidence in talking about your research. 1. For the interviewer, the "right match" means the scholarship providers have identified individualscapable of performing the immediate challenges. More importantly, they hope the individualshave the potential to be future resources and assets to the institution offering the scholarship. 2. You are being interviewed by the interviewer to determine whether you have the qualificationsnecessary to undertake the scholarship and whether a mutually rewarding professionalrelationship can be formed. 3. Similarly, you must determine whether you can be successful in the scholarship and whether thisopportunity will enable growth and development. What interests you about the scholarship? PhD progress issues and achievements to date. Discussion of proposal and how past workwill fit into work to be done now. Where does the candidate see the award fitting into their future goals? What interested the candidate in coming into this field? What other financial resources does the candidate have available? What would I be expected to accomplish through this scholarship? What are the greatest challenges experienced by people undertaking the scholarship?Not letting these kinds of subjects catch you off-guard is a key factor in maintaining your composure during an interview. Rehearse these questions and answers in your mind or out loudin the days before the interview. Overbearing, over-aggressive or egotistical behaviour. Lack of interest and enthusiasm - passive and indifferent. Evasiveness; making excuses for unfavourable factors in academic history. Lack of commitment to fill the scholarship available. Failure to ask questions about the scholarship. Lack of preparation for interview -- failure to get information about the organisation, resultingin inability to ask intelligent questions. 1. If you are interested in the scholarship, let the interviewer know. If you feel the scholarship isattractive and you want it, ask about the next step in the process. Be a good salesperson andsay something like: "I'm very impressed with what I've heard. I am confident I could do anexcellent job in the scholarship you have described to me." The interviewer is likely to beimpressed with your enthusiasm. 2. Don't be too discouraged if no immediate commitment is made. The interviewer will probablywant to communicate with the other committee members or possibly interview more candidatesbefore making a decision. 3. If you get the impression that the interview is not going well and that you have already beenrejected, don't let your discouragement show. Once in a while an interviewer who is genuinelyinterested in you may seem to discourage you as a way of testing your reaction. 4. Thank the interviewer for his or her time and consideration. If you have answered the twoquestions-- "Why are you interested in this position?" and "What can you offer?" -- you have doneall you can. Do plan to arrive on time or a few minutes early. Late arrival for an interview is never excusable. If presented with an application, fill it out neatly and completely. Don't rely on your application or resume to do the selling for you. Interviewers will want you to speak for yourself. Do greet the interviewer by last name if you are sure of the pronunciation. If not, ask theemployer to repeat it. Give the appearance of energy as you walk. Smile! Shake hands firmly.Be genuinely glad to meet the interviewers. Do wait until you are offered a chair before sitting. Sit upright, look alert and interested at alltimes. Be a good listener as well as a good communicator. Do look the interviewer in the eye while speaking. Do follow the interviewer's leads, but try to get the interviewer to describe the scholarship to youearly in the interview so that you can apply your background, skills and accomplishments to thescholarship. Do make sure that your good points come across to the interviewer in a factual, sincere manner.Stress achievements, eg. academic achievements. Do always conduct yourself as if you are determined to get the scholarship you are discussing.Never close the door on an opportunity. Do show enthusiasm. If you are interested in the opportunity, enthusiastic feedback canenhance your chances of being furthered considered. If you are not interested, your responsiveness will still demonstrate your professionalism. Don't forget to bring a copy of your resume! Keep several copies in your briefcase if you areafraid you will forget. Don't answer with a simple "yes" or "no." Explain whenever possible. Describe those thingsabout yourself which relate to the situation. Don't make unnecessary derogatory remarks about your present or former employers or lecturers, students. Adapt - Listen and adapt. Be sensitive to the style of the interviewers. Pay attention to thosedetails of dress, office furniture, and general decor that will afford helpful clues to assist you intailoring your presentation. Relate - Try to relate your answers to the interviewer and the organisation. Focus onachievements relevant to the scholarship. Encourage - Encourage the interviewer to share information about the organisation todemonstrate your interest.